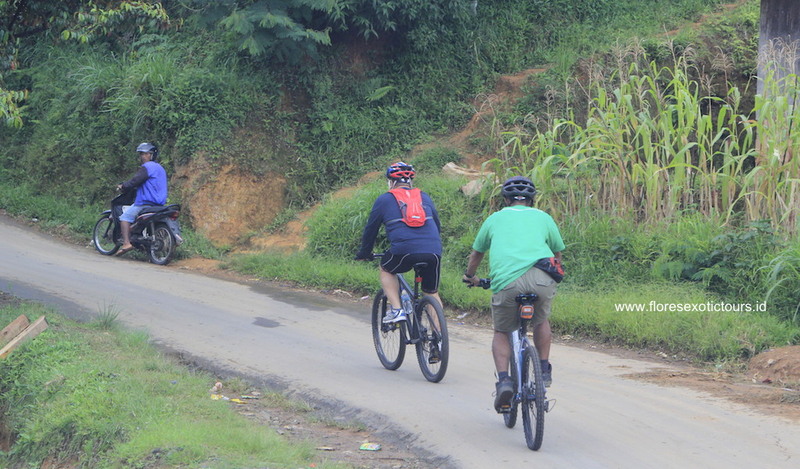 Flores cycling tours is another way to explore Flores island, biking pass Flores main road and some part is off road cycling with combination of down and up hill. Start cycling from your hotel to Paga beach with coffee stop in Nita, (approx. 2.5 hours). Enjoy the serenity and the white sandy beach of Paga Beach during lunch, then continue to Moni by car, Dinner and overnight at the Kelimutu Eco Lodge in Moni. In the early morning at 04.00 am by car to the three colored lakes of Kelimutu, one of the most spectacular and mysterious sights in Indonesia. You will witness a beautiful sunrise. Then you return cycling to the hotel starting from the parking area of Kelimutu. After having breakfast in the hotel you continue the trip by car to Nduaria, then biking to Ende. Start cycling from your hotel to Nangapanda, in Penggajawa you can stop and take a bath on the beach, and seeing the blue pebbles stone. Continued by car to Boawae, take a lunch at local restaurant, by car again to Rowa, and cycling to the hot Spring in Soa. From Soa drive to bajawa, dinner at local restaurant before check in at hotel. Overnight at Sanian Hotel Bajawa. Morning biking from your Hotel to Bena Village and continue to Waebelah, Bena is the most famous and also most visited village in the Ngada district. With its impressive stone formations and ancestral shrines, as well as traditional houses, Bena has turned into a signpost for Ngada culture. Then continue to Aimere with its “Arak” distillation and palm wine fresh used tapp, Lunch in Borong or Aimere, on the way to Ruteng, you can visit Ranamese lake in the cloud forest. Dinner at Agape Restaurant and Overnight at Susteran MBC, Ruteng. Departure from your hotel, drive to Cancar to see the unique Lingko ricefield, circular terraces arranged like a spider web, Cycling around the rice field and villages in Cancar for 1 hour, continue to Labuanbajo. Down hill Cycling from Roe to Labuan bajo for 1.5 hour. Dinner and overnight at Puri sari Beach Hotel.